I write for children of all ages from picture books up to young adult. My debut YA, TOUCH OF DEATH, released January 15, 2013 through Spencer Hill Press. Also look for my other YA novels: STALKED BY DEATH (Spencer Hill Press, August 23, 2013), THE MONSTER WITHIN (Spencer Hill Press, April 2014), THE DARKNESS WITHIN (Spencer Hill Press, TBA), and INTO THE FIRE (Month9Books, spring 2014). My debut MG series CURSE OF THE GRANVILLE FORTUNE releases fall 2014 through Month9Books. Well I love Kelly's writing so that would be a good reason. However, I am interested in the entire synopsis. Like how did she come back and how they will solve the problem. Thank you so much for the chance to win! This book sounds so good!!! I think that it will hold my attention and sounds like its going to be an interesting read of what is going to go on between the girl and the coven of witches!!! I seen this book awhile back of was interested in reading it- can't wait!!! I am really looking forward to reading about a REAL psychic vampire!! How interesting. I cannot wait to read about this woman who must kill to survive. I am looking forward to reading about a real psychic vampire. This book sounds so very interesting. I cannot wait to get my hands on a copy. "crawls out of her grave" - got my attention. I am looking forward to what Ethan had to do to save Sam. I love the idea of conquering death. It has an interesting premise and I'm intrigued that she "crawls out of her grave". Also romance! This one sounds really good! I enjoy books that take place after a character's death. Just thought of someone crawling out of their grave sounds so creepy and it sounds like a great start to a book. The idea of this books sounds very interesting and exciting! good story and happy ending.. Sounds really good.Im so excited about this. I've loved the story!!!! One more different universe that I want to discover reading this book!!! It sounds so unique and interesting..... I can't remember ever reading a story quite like this one and I am seriously excited about it. And the mystery of her coming back is seriously making me curious! Seeing how this story will end would be most interesting! I love paranormal and it sounds different from the usual, which is a trait I prefer in books. Also, I've heard a lot of good of it. 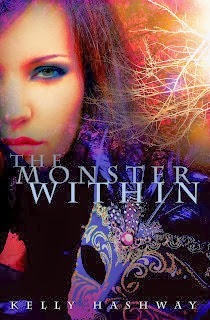 I love paranormal and The Monster Within sounds different from the usual, which is a trait I prefer in books. Also, I've heard a lot of great remark of it.